Flyer Basket Raffles Buy Tickets! Venue How Can I Help? 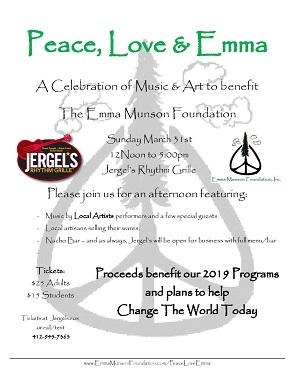 We hope you can join us on Sunday March 31st at Jergel's Rhythm Grille in Warrendale, PA - it will be our 5th annual fundraiser at this great location and we're so excited for the day. We're working on the list of performers, stop back again to check-in! For her brief number of years, Emma was so mature in her understanding and respect for others in this world. She had an uncanny ability to light up a room when she entered, and was compassionate and confident and never 'followed the crowd'. During her youth, she drew a close group of friends and can be remembered as one of the most 'accepting' people that most will ever meet. Emma had the voice of an angel and creativity for visual arts which led her to VCU, the #1 Public Art program in the US. During her first year in the Art Foundation program, she was contemplating how to use her love of The Arts to help others, considering a course change to Art Therapy. It was clear from an early age that Visual and Performing arts would part of Emma's life and something that she would like to share with the world. Because Emma was an aspiring artist, we wanted to invite local artists and vendors to offer for sale their creations - We hope that this type of exposure will help them grow their business and allow you a chance to pick up a unique gift. We have three awesome vendors ready to share their creations with you! Lindsay Erisey is a DoTerra oil distributor and will have lots of essential oils for you to choose from. David Mueller is an awesome artist who puts a fun, light hearted, colorful spin on all his unique pieces. Lucy Kelly takes vintage items and repurposes them into cool jewelry pieces. We will also have a Kindness Rocks painting table - come and check it out. Jergel's is graciously hosting our event and the club is open for normal business. We're working on the details, but there will be some type of complimentary buffet during the day and if you're interested in a bigger meal - the full Jergel's menu is available for your individual purchase. 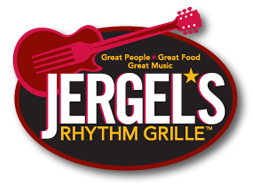 If this will be your first visit to Jergel's, we hope you'll come back for a meal or show and show them how much you appreciate their support of our foundation. Check out their upcoming shows by clicking here. Definitely the easiest way to show your support! Tickets can be purchased on-line - Click Here and come out on Sunday March 31st anytime between 12 and 5pm. You can stay connected with our foundation via Facebook and join us through the year as we work to make a difference. You can Like us and share a link with your friends to help us build our network of supporters. We have 3 very important programs that we hope to continue to grow and we can do so much more by enlisting financial sponsors. The Emma Munson Foundaion is a 501(c)3 non-profit organization and donations are tax exempt. We have a donation letter available Here that you can take to businesses in your area to ask them so support this effort. Please email PeaceLoveEmma@EmmaMunsonFoundation.com with any questions or updates if you are able to find sponsors. All donations will be recognized with a tax receipt along with our thanks! In 2014, we formed the Emma Munson Foundation, a 501(c)3 non-profit organization with a mission to 'promote charitable activity to improve the quality of life.' We hope to spark a youth volunteer movement via Emma's Peace Gang and fund projects aimed at 3 of Emma's passions - Mother Earth, Mankind and the Arts. Emma's Peace Gang is a loosely organized volunteer force that is tightly linked to the inspirations of Emma Munson, who died suddenly and tragically on Sunday October 6, 2013. The group has a mission to serve the people of this world through expressions of love towards Mankind, the Environment and the Arts - 3 of Emma's passions. You register (HERE) and begin to record your time volunteering for charitable causes - most anything that helps make a difference. The time is 'confirmed' and 'banked' to support financial contributions to the Emma Munson Foundation, Inc. For each $10 donated, our gang will perform at least 1 hour of volunteer activity. The more that is raised, the more work we need to do! How do I get started and join the Gang?